Last week we announced that we would be launching our new Meal Mentor app for iOS and Android in a couple of weeks – woot-woot! The app is going to to make meal planning and meal prep much SO.MUCH.EASIER (especially on the go) and will be available for iPhone and Android by November 5th. What happens with existing memberships? If you are a VIP Annual members, your account will transition to the Standard Membership for $149 / year. 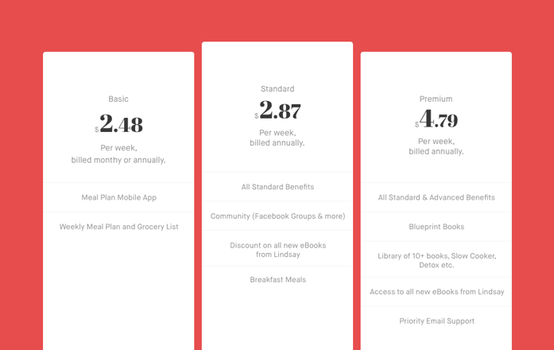 If you pay monthly, your account will move to the $14.99 Basic Membership. If you want to keep access to the Community online forums, you will need to upgrade to the Standard Membership. Once your account is updated, your billing cycle won't change. If you have any questions, join us for a Facebook Live Q&A with Lindsay and Scott Nixon on Tuesday, October 30th at 1 PM Eastern / 10 AM Pacific. Thousands of members have prioritized their health, time, and money — and so can you. Join a community of like-minded people — including doctors, dietitians, nutritionists, and athletes — who trust us to help make vegan plant-based meal planning effortlessly easy, delicious, and nutritious. Most of our members report spending $30 a week per person, or $45 if they choose organic ingredients. If you don't already have a well-stocked spice rack or pantry, your first week will cost more to buy some staple ingredients you won’t need to purchase again for awhile. We also recommend looking for on-sale vegetables, bulk options, and buying frozen instead of fresh whenever you can. Absolutely. Our app allows you to swap out recipes with others, and by shopping for your own ingredients, you can customize your meals based on personal preferences and dietary needs. Our recipes also serve 1-4 people, so they work for individuals, couples and families — plus the variety of delicious meals will be loved by everyone (yes, even your non-vegan partners, friends, and kiddos). Get started today with Meal Mentor! Meal Mentor mobile app launches Nov 5th.